One effective practice is to include air filter checks, cleaning and changes in the annual preventive maintenance program. Most experts recommend that technicians change or clean HVAC system filter media regularly, but there are exceptions. If certain areas are only occupied occasionally and the air handling system if off, managers should consider this downtime when setting the frequency of changes. Also, if the particulate load changes, such as when a nearby industrial or energy plant is new or operates on a seasonal cycle, managers need to consider this to balance function with cost without sacrificing either. The best way to ensure such a balance is to use predictive maintenance. Pressure monitoring equipment compares inches of water column or inches of mercury on the intake versus exhaust sides of the filters. Manufactures can provide the optimum pressure drop — Delta P — across the filters. As a filter becomes blocked, the differential pressure increases, causing reduced air flow. The air filter vendor can give specifications for optimum filter change or cleaning. This approach yields a variable but optimal time between filter changes. If required changes are too frequent, managers might need to review filter specification for a possible upgrade or consider a bulk purchase to get a higher quantity discount. 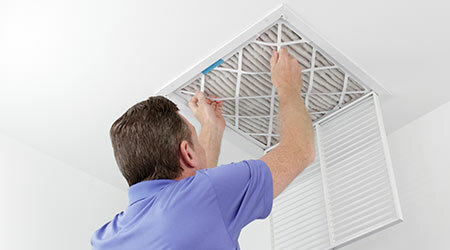 Between changes, technicians should check filters visually for excess buildup, tears and leaks, as well as separation of the filter from the frame. One bonus for doing this is saving fans, motors and electrical components from dust buildup that can cause premature failure.